This collection of Germinis, Marie Claire roses, Solidago, Sunflowers, Pistagia, and Feeling green blossoms are perfect for brightening up any room! The superb colour combination is soothing as well as invigorating which makes this bunch perfect for any occasion! 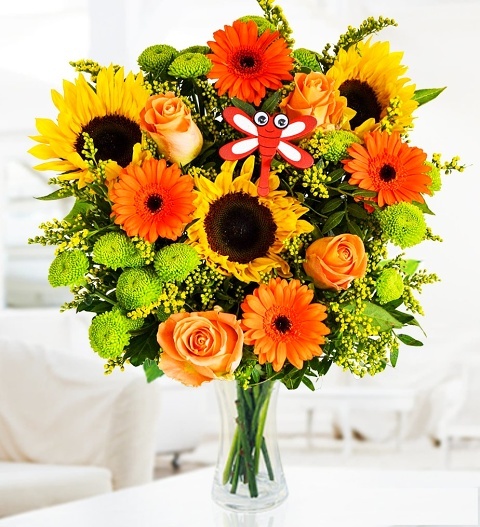 Available for UK next day delivery, our expert florists pay attention to even the smallest details and have also included a happy dragonfly pick to complete this beautiful bouquet and to offer the recipient a keepsake that they can treasure. Chocolates may contain nuts.